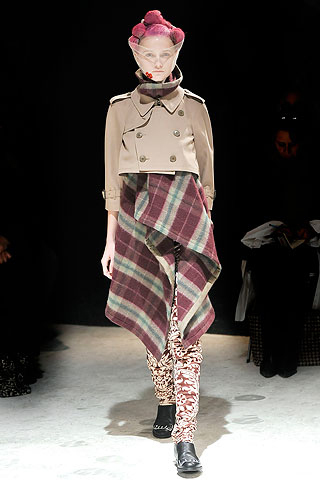 If I could afford the Comme des Garcons trench (FW/09) I would buy it. I would buy one in every color and style. 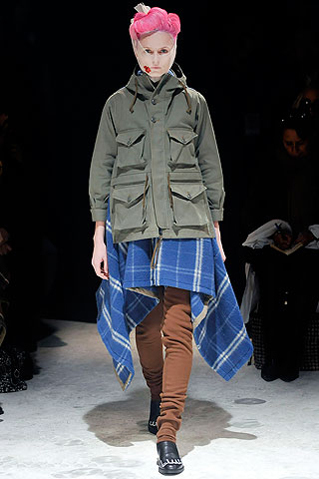 This coat makes me want to cry. OK, I’m a bit over dramatic but what the hell. So of course on my student/designer for hire/can I shorten some pants for you salary, I could never afford a coat that would cost more than what I paid for my car. So I headed out to my favorite thrift in search of clothing that could be turned into something resembling the coveted trench. I lucked out big time. First I found a short mens trench that was a great color and weight but also had the most amazing brass buttons. In the women’s section I found a long red and black wool blanket skirt. I had to take the jacket body and sleeves in quite a bit because they were both really wide. Then I chopped off about 12″ of the length and removed all the buttons, pockets and plackets. I reattached about 5″ of the length including the original hem to form a really straight, thigh length coat. 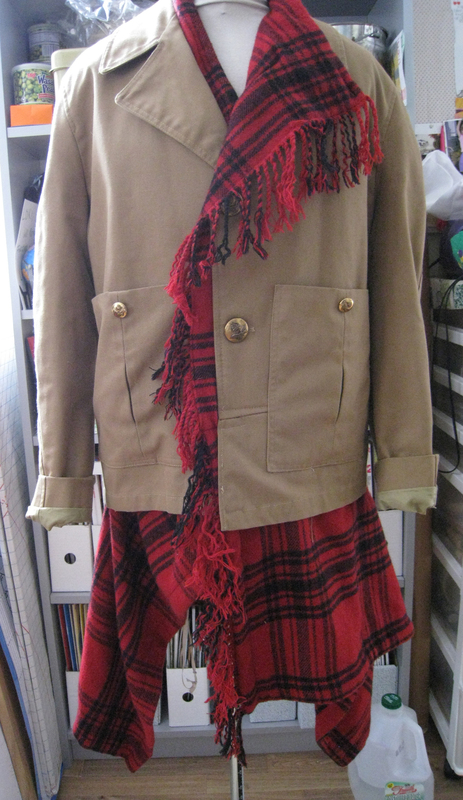 Then I draped the skirt around and under the coat until I had an idea about how to cut it. I used the waste band of the skirt as a scarf around the collar and the fringe from the front of the skirt to trim the lapel and left front. I trimmed up the rest of the skirt into a rectangle and then cut a square from the center of the cut edge, basically making a horse shoe shape out of it. Then I took the horse shoe shape by the inside corners and stretched it out so that it formed a straight line at the top with the corners of the original rectangle hanging down all pointy and uneven. Get it? Kind of tricky to explain, but it worked! I sewed the pockets and buttons back on, reattached the lining and tried it on. I’m happy with it. It’s not quite as amazing as the original but it is definitely my style, I think it looks like something I would make and wear — it’s more me than the Comme version. I am tempted to get into my feelings about copying other designers work, which are mixed. But I’m just not in the mood, I just want to enjoy my new coat and this snowy day.